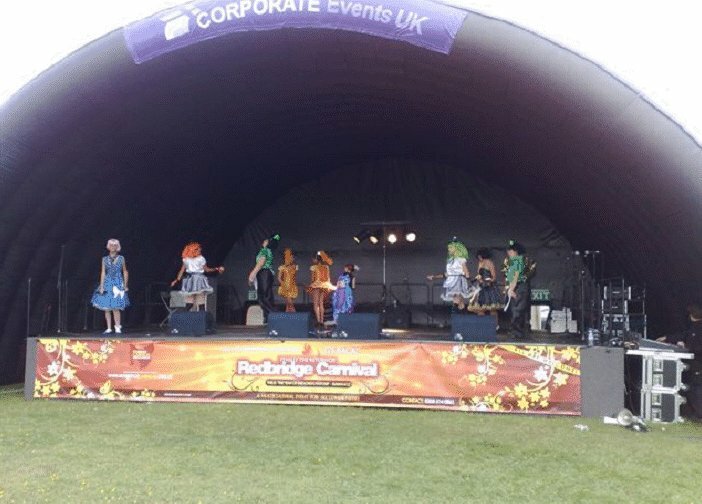 Staging Hire UK have a wide range of outside stages and stage systems for hire in the UK and Europe. Outside Stage Options there are a few choices for you here is just a few of them. The most basic way is just too literally hire weather proof decks, these systems come as standard with a non slip surface, hand rails, steps and solid front and sides valance. The Festival Stage system is an inflatable arch over the stage with two rear fire exits built in. Our current stage cover is internally capable of housing a stage of 12metres wide and 8 metres deep. The stage for the arch cover is as like our other stages available in the following sizes width and depth dividable by 500mm and the height is as our standard increments of 200mm climbs. The festival stage arch has a removable front section where you can put your company logo etc on to it. We are looking at getting bigger Arch stage covers in for 2009 please call for further details. The Truss roofed stage hire systems are a little more adaptable as they will have a roof, back on them and sides as and when required. Where there is a truss frame already built this makes them ideal for hangings lighting, Star Cloths, Banners and many other things on to the system. We can even supply small marquees as changing rooms for your performers to get changed in. Contact us today at Staging Hire UK for further information on our Outside Stages.